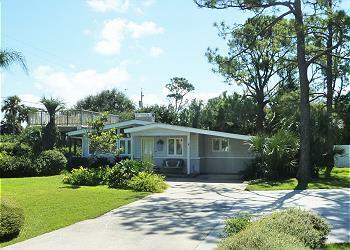 Unwind in this delightfully decorated 3 bedroom, 3 bath beach cottage just one house off the ocean. The three private bedrooms each have their own bath, the spacious Great Room is comfortably furnished and the gourmet kitchen is well equipped. Relax with your morning coffee on the covered deck before heading up to the sundeck to catch a few rays and take in the spectacular ocean views. Parking for 4 cars. MW, DW, W/D, 4 Cable TVs, 4 DVD, WiFi, Gas Grill. Pool Pass @ Days Inn BEDS: 2 King, 1 Queen. Sleeps 6. NO PETS, NO SMOKING.